Be the first to share your favorite memory, photo or story of Leah. This memorial page is dedicated for family, friends and future generations to celebrate the life of their loved one. Leah Dawson Matney, 93 years of age of Vansant, VA, passed away Monday, November 12, 2018 at Buchanan General Hospital. Born May 22, 1925 in Grundy, VA, she was the daughter of the late John M. Dawson and Julie Rowe Dawson. 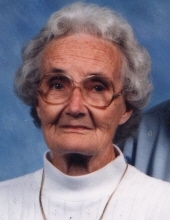 Leah enjoyed quilting, gardening, cooking and loved her grand babies. She was a member of Little Prater Church of Christ, a loving mother, grandmother, sister and aunt. In addition to her parents, she was preceded in death by her husband Arnold Matney, daughter Shirley Hurley, son Jerry Michael Matney, grandson Christopher Keith Matney, sisters Evelyn Dawson, Flossy Keen, Ruth Dales, brothers Leeland Dawson, Bascom Dawson and Dewey Dawson, and son-in-law Warren Dotson. Survivors include her daughter Rita Dotson of Vansant, VA; sister Ruby Justice of Grundy, VA; brothers Donald Ray Dawson and wife Ann, Glenn Dawson and wife Irene all of Grundy, VA, Keaster Dawson and wife Lois Ann of Vansant, VA.
She is also survived by her grandchildren: Jarrod Matney, Jennifer Matney, Bryce Hurley, Cliff Dotson, Ryan Dotson, and Susane Barfield, ten great-grandchildren, several nieces, nephews and friends. Funeral service for Leah Dawson Matney will be held a the Shortridge-Ramey Funeral Home Chapel of Grundy, VA, Thursday, November 15, 2018 at 1:00 p.m. with Evangelist J. R. Justus and Deacon Gerald Vanover officiating. Burial will follow in the Mountain Valley Memorial Park of Big Rock, Virginia. Active pallbearers will be her grandsons: Cliff Dotson, Ryan Dotson, Bryce Hurley, Jarrod Matney, Ricky Fields and Kevin Dawson. Honorary pallbearers will be the members of Little Prater Church of Christ, Hearl Shortridge and Willard Hurley. The family will receive friends at the Shortridge-Ramey Funeral Home Chapel of Grundy, VA, Wednesday, November 14th after 6:00 p.m. with evening service to be held at 7:00 p.m. The family of Leah Dawson Matney have entrusted the care of their loved one to Shortridge-Ramey Funeral Home of Grundy, VA.
"Email Address" would like to share the life celebration of Leah Dawson Matney. Click on the "link" to go to share a favorite memory or leave a condolence message for the family.